At dawn on 20 November 1917, the British Third Army launched an attack towards Cambrai using innovative methods that were to become a common feature of the fighting on the Western Front in 1918. The assault utilised the largest number of tanks yet assembled. It used an artillery barrage that was not previously registered, aiming to return an element of surprise to the battlefield. But ultimately, early British gains were largely retaken by German counter-attacks. 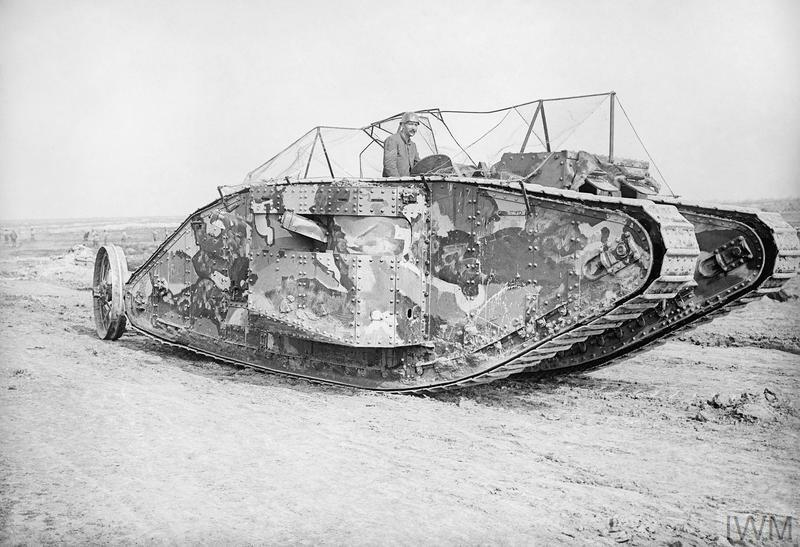 The Battle of Cambrai was the first large-scale use of massed tanks in battle. 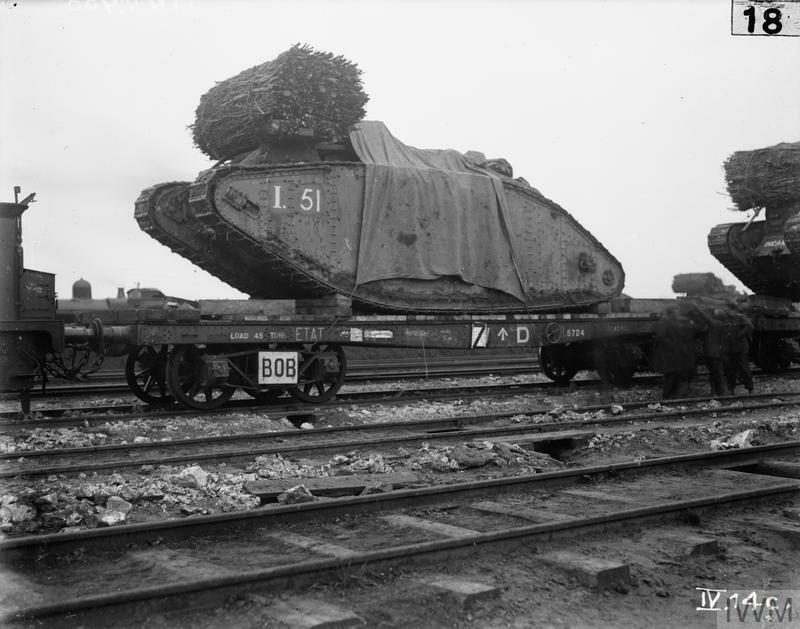 Here British Mark IV tanks are being loaded onto railway trucks for transport to the front line, as part of the significant logistical preparations required for the attack. These are 'Female' tanks armed with machine guns, as opposed to 'Male' tanks armed with small artillery pieces. In total, the British deployed 476 tanks at Cambrai, including 378 in combat roles. The attack began with significant gains on the opening day through a combination of effective artillery fire, infantry tactics and tanks. British forces made advances of around 5 miles, taking a number of villages. But by the end of the first day, over half of the tanks were out of action. As the battle continued, British progress slowed amidst intense fighting. By 28 November the British had reached a position on the crest of Bourlon Ridge, where they held a salient. Two days later German forces launched a counter-offensive, utilising intensive artillery fire and infantry tactics that made use of infiltrating ‘storm’ troops. 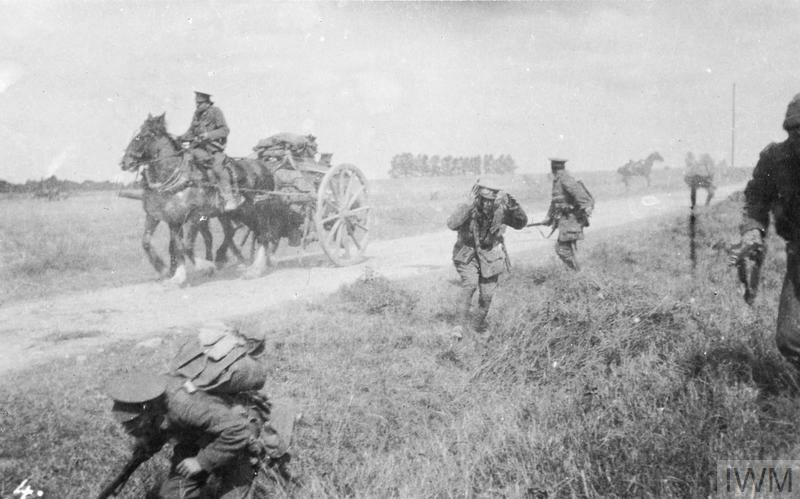 After more intense fighting, British forces retreated from their salient position, only leaving them with the gains they had made around the villages of Havrincourt, Ribécourt and Flesquières. The Battle of Cambrai ultimately had little strategic impact on the fighting on the Western Front. Yet in the tactical methods used by both sides it was a precursor to the fighting of 1918 and also pointed the way towards more sophisticated combined arms tactics and armoured warfare. At the turn of the twentieth century railways dominated land transport. Motor vehicles had yet to seriously threaten the railways, except for local traffic, while aviation was at an embryonic stage.